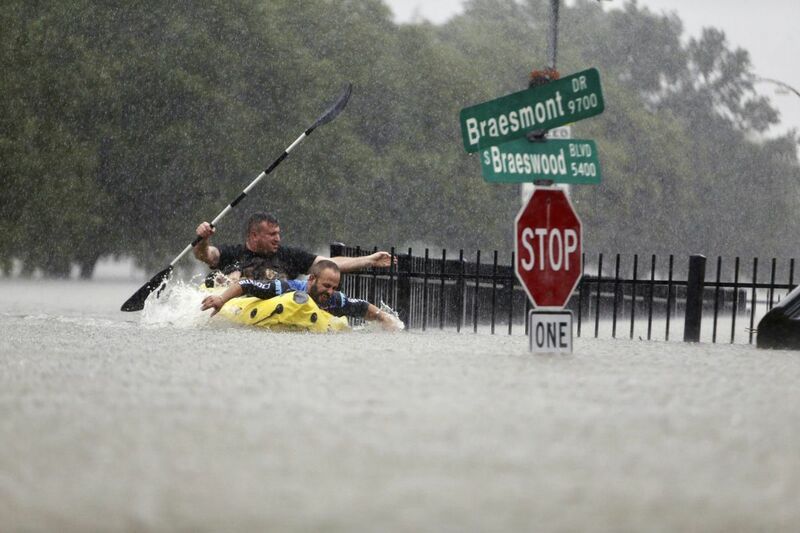 Two kayakers try to beat the current generated by Harvey’s flooding rains. Harvey might soon have company, the National Hurricane Center says. As floods ravage Houston and other parts of southeast Texas, those not affected by Hurricane Harvey were left asking how they could help. The American Red Cross: The Red Cross has set up this webpage where users can make a one-time donation — via credit card or PayPal — specifically to those in the hurricane's path. To make a $10 donation to relief efforts, text HARVEY to 90999. Donations to the Red Cross can also be made by calling 800-435-7669. The Salvation Army: People can donate to the Salvation Army's work in Texas by going to the website or calling 800-725-2769. One-time $10 donation can also be made by texting STORM to 51555. Save the Children: To aid their efforts tending to children and families affected by the storm, donate online at this webpage. Americares: The nonprofit, focused on medical outreach, is also accepting one-time donations for Hurricane Harvey relief efforts on its website. Faith-based aid: To donate to the efforts of Catholic Charities U.SA., the relief organization of the U.S. Catholic Church, go to its website or text CCUSADISASTER to 71777. The Mennonite Disaster Service, based in Lititz, Pa., is accepting donations to its Harvey relief efforts online or by check made payable to Mennonite Disaster Service, 583 Airport Rd., Lititz, Pa. 17543. Lutheran Disaster Response takes donations on its website, as well. Food Banks: Feeding Texas, the state's food-bank network, accepts monetary donations on its website. The Houston Press has also compiled a list of food banks in the storm's path for those who'd prefer to donate directly to a location. Animal shelters: Austin Pets Alive! is assisting shelters in the direct line of the storm; donations specifically to its Hurricane Harvey response can be made on its website. Donations can also be made on the websites of the Houston Humane Society, the San Antonio Humane Society, and the Texas Society for the Prevention of Cruelty to Animals, all of which are assisting in storm response. Global Giving: This crowdfunding site has set a goal of raising $2 million to help those affected by the hurricane. The money will go to first responders, then to local recovery efforts. The page to make donations to Global Giving is here. Other ways to help: Charity Navigator created a page with links to vetted charities that are assisting in Texas.